Here in the high-desert Southwest, our cold-weather vegetables need to be planted by mid-March, and so late February is my last good chance to review my seed box and order what I need. This resulted in my sending off a frantic order for sugar snap peas. My attachment to them is strong, largely because I love English (shelling) peas but never find time to shell them. 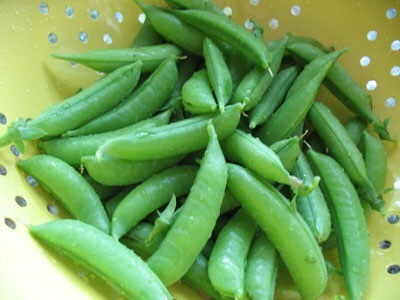 My favorite snap pea is the original Sugar Snap. This variety has some disadvantages: it climbs 5-6 feet and has to be provided with support, the pods have strings and need to be de-stringed before cooking, and it doesn’t have much in the way of disease resistance (although I have had no problems with disease.) It has a single incomparable advantage: flavor that none of the newer, neater varietals can live up to. For best flavor, the peas inside the pod have to be allowed to develop. Don’t pick them in the flat snow-pea stage. Then rinse and string the pods, which is a very quick job, and steam them to eat with butter, stir-fry with some scallion and ginger, or cook them in your own favorite way. Yum. In my opinion they develop a soapy taste when frozen, so I don’t recommend “putting them by.” Eat mountains of the fresh article and give any extra to people you really like. The important thing is, order those seeds now. And don’t forget to plant extra so that you can cut pea shoots. Cut when they are 6-8 inches high, pea shoots are delicious in salads and stir-fries.